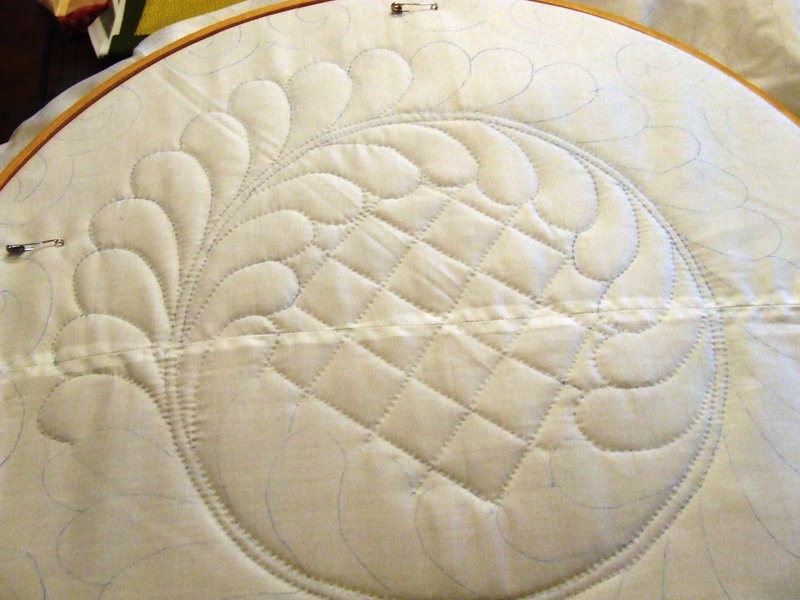 After I finished the treadle quilting on the last quilt ( https://timquilts.com/2016/02/03/free-motion-treadle-video/) I began thinking of the hundreds of quilt tops I have. Some of them are really great and deserve hand quilting. Some of them aren’t so great. One of the reasons a quilt top gets packed away and not quilted it that the maker wasn’t really happy with it. Most often it seems that it is because they really aren’t flat and therefore very hard to quilt. 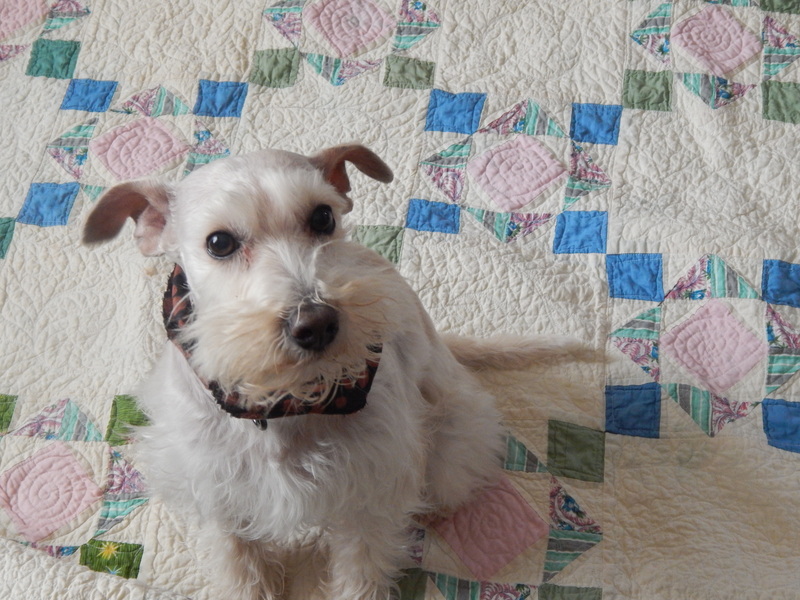 I decided to try quilting one of my less than perfect tops with the treadle . The pink center squares are polyester knit. Polyester was first introduced to the American public in 1951. It was advertised as a miracle fiber that could be worn for 68 days straight without ironing and still look presentable. It still looks presentable and it does help date the top as no earlier than 1951. I could have separated all the blocks, pressed them, squared them up to all the same size and reassembled it but this one just didn’t seem like it was worth the effort….sometimes a quilt top is in really bad shape but it speaks to me and says fix me…this one didn’t. I used Natures touch cotton batting and a green print backing fabric and pin basted it as flat as I could. 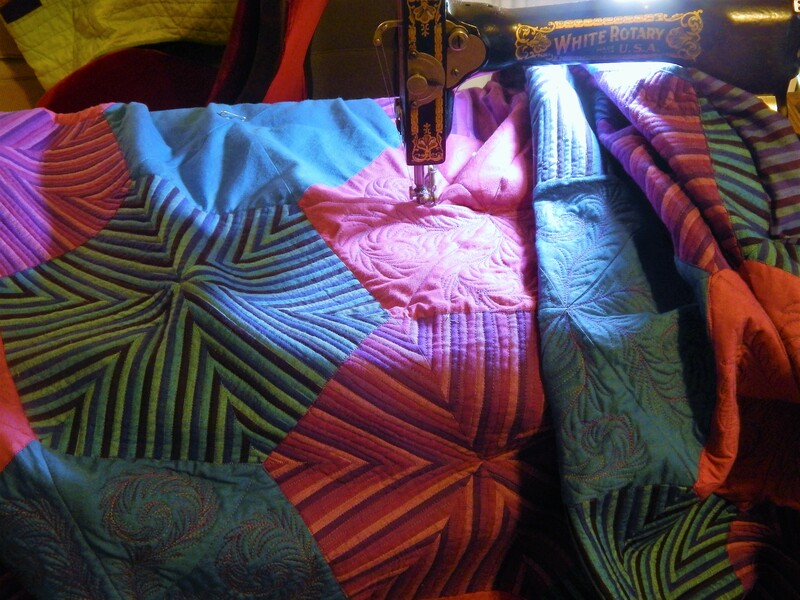 I used a walking foot to sew between the blocks and then free motion quilted on the Treadle machine. 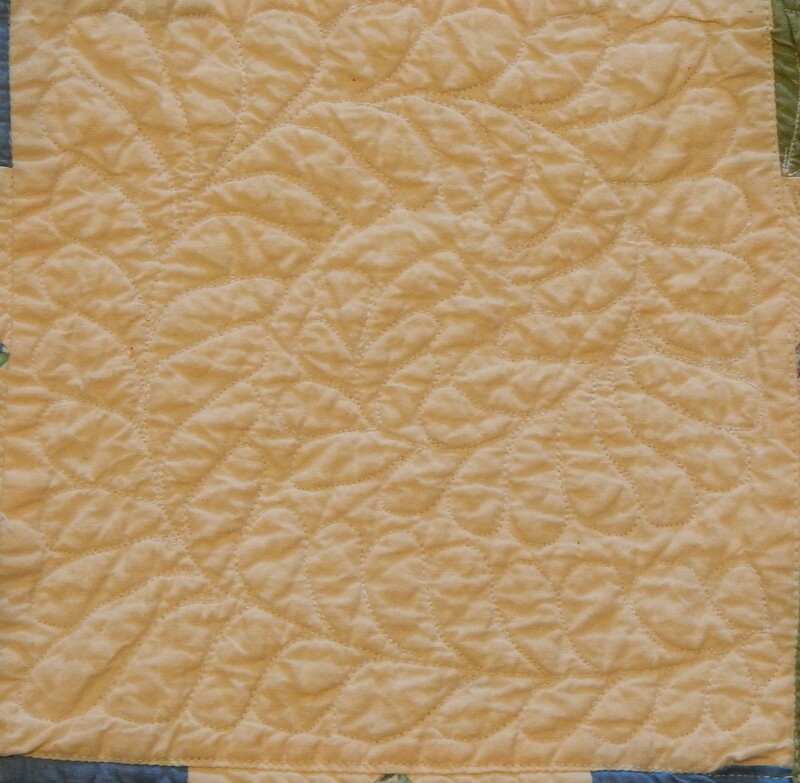 Here you can see how it looked part way through the quilting. The setting squares really were puffy! It made for a challenge to quilt that out without a bunch of puckers and pleats. There are a few but overall it turned out pretty good. 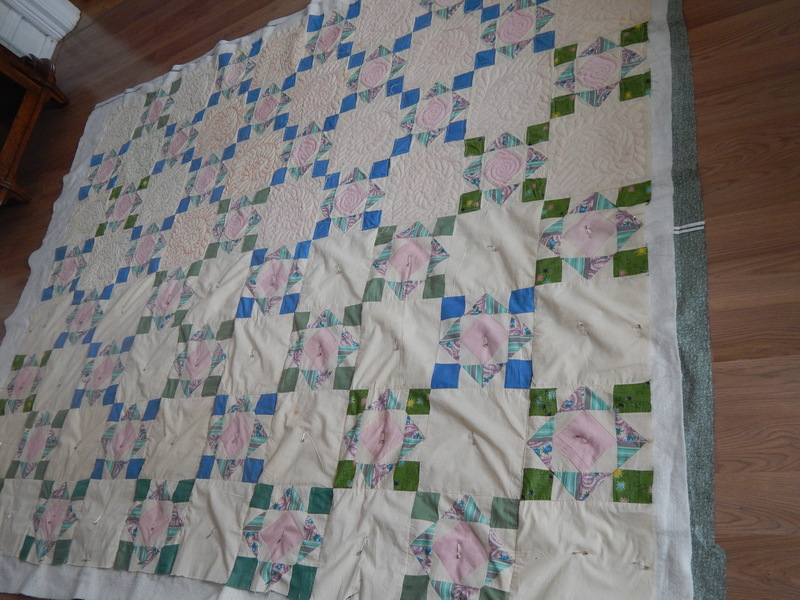 Lots of quilting helped push down the fabric and make it look flat. 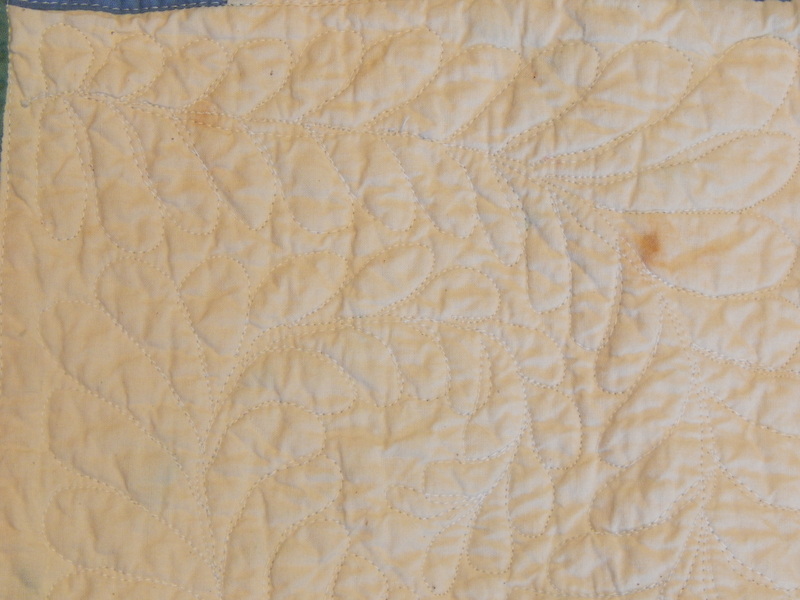 I washed and dried it and the shrink of the batting causes the “antique crinkled look” which hides many flaws. There are quite a few stains that did not wash out. I’ll spot treat them and wash it again to see if they come out. I am back to work on my applique rose top. Great post! More is best in these types. Thanks for sharing the knowledge looks great. You are amazing! It’s is so pretty! The little pink blocks in the center look like roses to me. Some sort of a flower. There’s a lot of truth in what you say about why things get put away. We can’t do it all either. We have to pick and choose our projects in life. Good for you! You inspire. 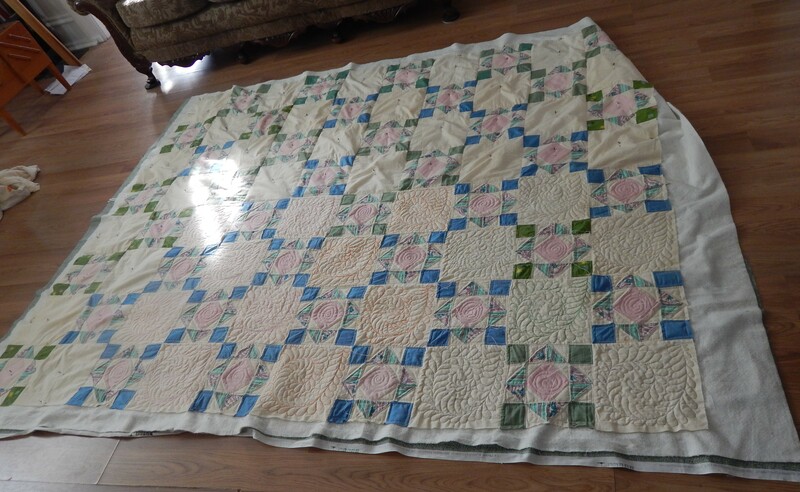 At first glance this quilt doesn’t look like it will ever turn out well, but you have done an excellent job getting all the puffiness out of the blocks. Well Done! What a challenge that has turned out to be quite a triumph. “Not bad” from Teddy is certainly an understatement. I really enjoyed reading the progress and seeing the end result. Congratulations from Liverpool, England! You have really brought that quilt top to life and it turned out wonderfully well. 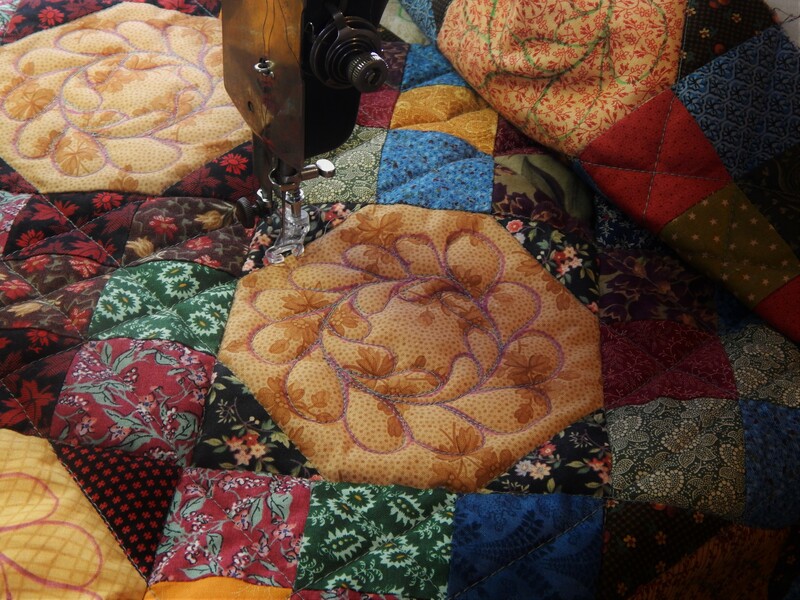 I’m so impressed with the quilting you did on it with a treadle! Congratulations on turning this into a lovely quilt! Thanks Cathi! 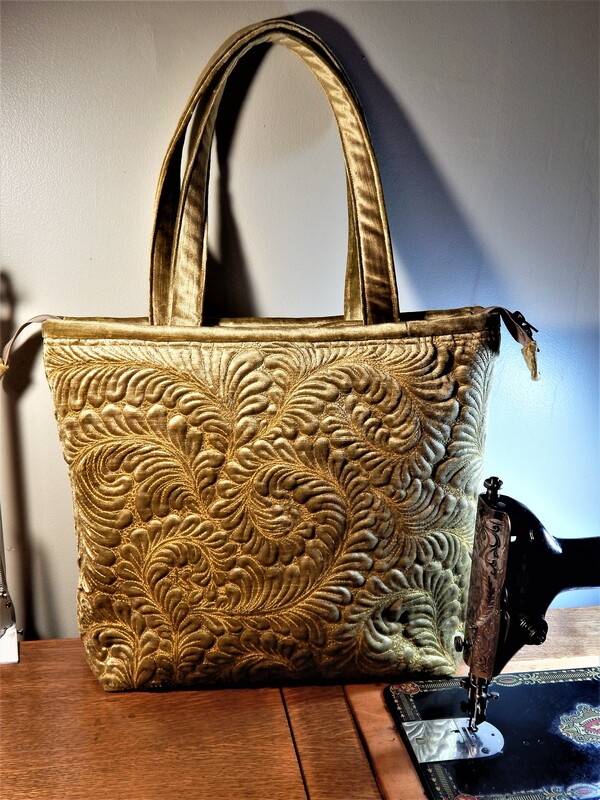 It sure was fun with the treadle….when I have tried the electric machine it just felt like work….this was so much different …..
Wow! That really turned out well. Its so pretty. Did you mark your free morin design or just eyeball it? …and you did this in 1? 2? Days?! I’m astonished. It came out so well, against all odds. Wonderful job. Re the stains: have you heard of a product called Orvus? It is supposed to be pure sodium laurel sulfate recommended for getting stains out of antique fabrics without harming the fabric. I have an antique tatted tablecloth that has some ancient stains and I’m going to try Orvus on it. You sure made it work. Very handsome quilt. So impressed with the fact that you are treadling the free motion. This is one of the reasons I’m not interested in quilting for other people. I don’t want to fix their mistakes. I’ve done enough of that with guild donation quilts and other group projects. That said, this looks terrific. 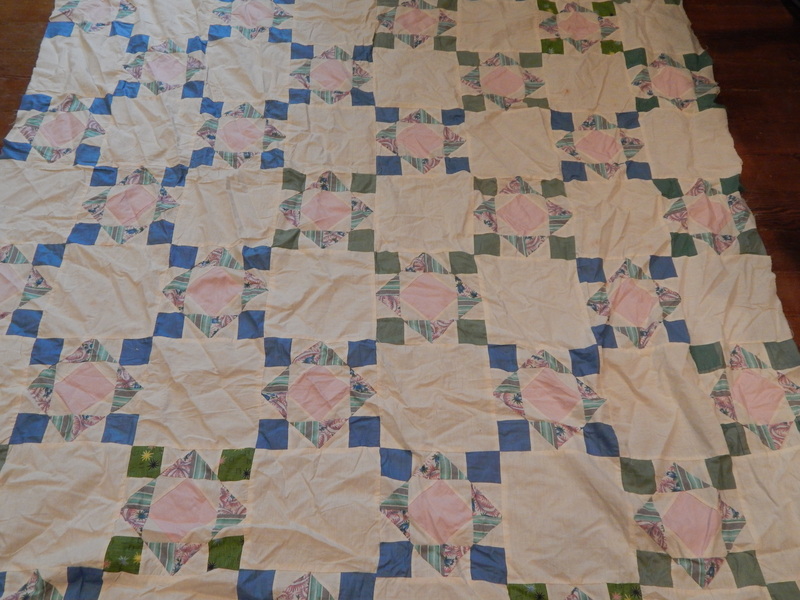 The cotton batting and LOTS of quilting made a great difference here, as well as the skill of the quilter. Whoa you preformed a miracle! It looks fantastic. Nice one, Tim — happy at long last, that top. The colors are beautiful, and your quilting is just wonderful! Thank you for sharing this. Love it! Thanks for sharing! Love Teddie too! Teddy’s the king of understatement. I’d say it turned out incredibly well. Seems you are not only a master hand quilter, but also a master free-motion treadler, too! The before picture makes the after picture seem pretty impressive. Nicely done. Awesome quilting Tim! I learn so much from you when you work on projects that you start out having doubts on. Everything can be made beautiful by you. This is incredibly inspiring Tim. Every treadle post you send makes me want to try out mine. I’m going to have to pull it out into the middle of the room so I don’t forget about it as soon as I walk away from the computer. Good for you! It’s a great finish! So wonderful to see these less-than-perfect quilts getting a chance at being used and loved! I love this quilt! You definitely turned it into a beautiful finish! Another calendar shot of Teddy. By the way – I saw your rose quilt at the AQS show yesterday! Was so excited to see it up close and in person. Couldn’t resist telling everyone looking at it about your blog and quilting and your latest free motion treadle quilting. Dear Tim, How do you make the rose design using a treadle machine. Looks difficult. Do you post these videos on utube?